Tonight on the way home the husband and I stopped off at our local super grocery store to pick out a Christmas tree. I knew what I wanted, a white tree with white lights and a bunch of multi-colored decorations. We got lucky and they had one white tree left for half off, so instead of paying $150 we got it for $75 = win. 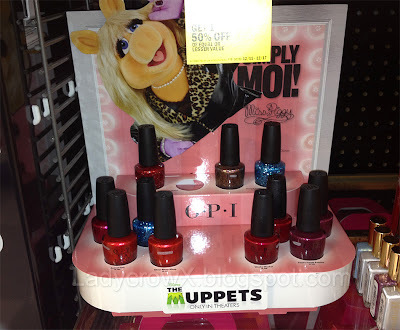 I decided to check and see if they restocked the OPI Muppets nail polishes as it was the same store that had the mutant bottles with the white stripe on them. They did restock but not with the same thing, this time they had a different display with different Muppet polishes. The funny thing is these bottles also had a white mark running through them. I decided to just accept it and grabbed 3 of them because honestly my Ulta had them for $12.50 and I didn't want to pay that when I could get them for $8.49. I picked up Meep-Meep-Meep, Pepe's Purple Passion, and Warm and Fozzie. I'd like to go back and get them all because they are really pretty but I'm not sure how many will be left and if I will have the funds after the holidays. Do you own any of these polishes? What do you think of them? I have De-Signer, De-Better (my favorite), Warm and Fozzie, Excuse Moi, Getting Miss Piggy With It, Rainbow Connection, and I got Pepe's Purple Passion for my mom for her birthday. I may go back to Salon Centric and get Going Gonzo, too. @dull_flame there is a pro store??? @LadycrowX Yeah, professional beauty suppliers. You have to be licensed or a student to shop there, though, they're not open to the public. It's 40-50% less than you would spend in regular stores, more if there's a sale. I could only find Warm & Fozzie, but it's great. I do have one exactly like the blue sparkles from the OPI Alice in Wonderland collection though!